People of faith, congregations and faith-based organization provide essential relief and recovery functions after disasters. It is essential for government personnel and institutions, therefore, to understand the potential contributions and unique needs of America’s faith communities. 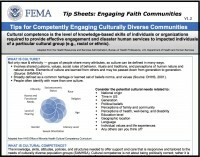 The following tip sheets cover foundational information to help emergency management professionals interact with a variety of religious groups. Much of the information also can help students, researchers, government agencies, non-profits and businesses learn about and develop relationships with communities. You can navigate these tips sheets using the menu to the right (on a computer browser) or below (on a mobile device). The DHS Center for Faith-based and Neighborhood Partnerships works to form partnerships between the federal government and faith-based and neighborhood organizations to more effectively serve Americans in need. As part of this effort, the University of Southern California Center for Religion and Civic Culture and the National Disaster Interfaiths Network developed a web-based course and its companion tip sheets (referenced above), in partnership with the USC Center for Risk and Economic Analysis of Terrorist Events (CREATE). FEMA personnel assisted the development of the course by providing their relevant expertise responding to disasters. 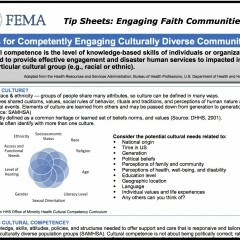 The course and these tip sheets provide emergency management professionals and faith and community leaders active in disaster with the religious literacy and competency tools needed to learn how to effectively engage religious and cultural groups and their leaders throughout the disaster lifecycle. Read more about the development of these tips sheets and their accompanying courses. For further training, please see EMI course IS-505, which was also developed by this partnership, and the Engaging Faith Communities in Disasters curriculum. Peter Gudaitis is the president of the National Disaster Interfaiths Network (NDIN) and a contributing fellow with the USC Center for Religion and Civic Culture.